There’s nothing quite like shaking, shimmying and generally gyrating. 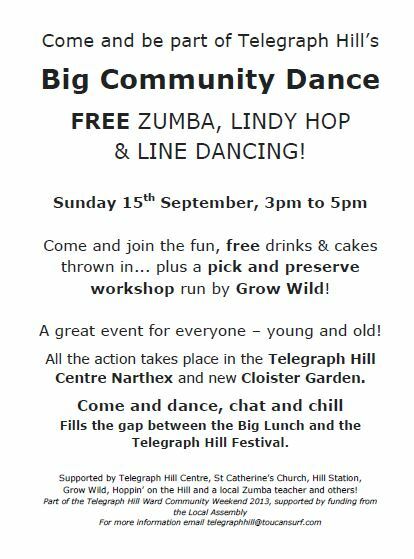 Telegraph Hill’s Big Community Dance is on Sunday 15th September 3pm to 5pm. There will be free drinks and cakes, and free Zumba, Lindy Hop and Line Dancing. Grow Wild will put on a free ‘pick and preserve’ workshop. What’s not to like? Sunday 15th September, 3pm to 5pm, Telegraph Hill Centre Narthex and new Cloister Garden. Supported by Telegraph Hill Centre, St Catherine’s Church, Hill Station, Grow Wild, Hoppin’ on the Hill and a local Zumba teacher and others!